Transform an unexciting interior or exterior wall with artificial grass. It gives the appearance of a living wall but has none of the care needed like real grass. With an artificial turf wall, maintenance is a matter of either brushing off, or using a blower, and it never gets brown spots! There is no pruning involved, and it doesn’t matter if you forget to water because it doesn’t need any. To have what appears to be a living wall all year round is a fabulous design feature. 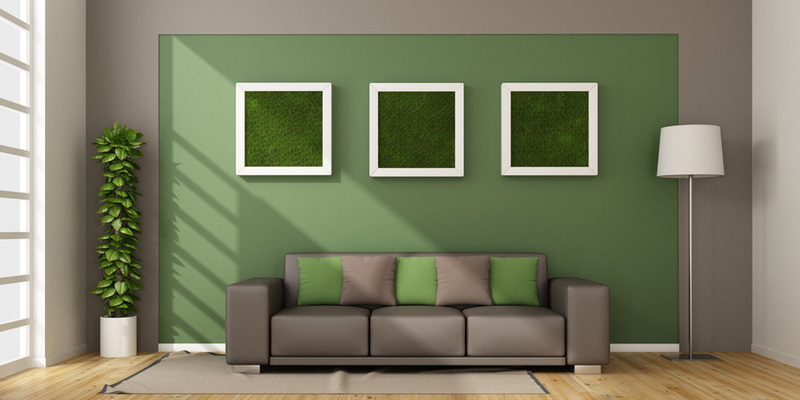 An artificial turf wall will liven up any space and give interest to an otherwise boring area. Contact Watersavers Turf to check out what we have to offer. We have over 60 types of fake grass that you can use for your artificial turf wall. For those who live in a small space, such as a condo or an apartment, it’s a low-cost way to add some color to a boring white wall without the need to prep and paint. It’s less expensive than buying art. It works great on a balcony for the look and feel of a real lawn. Just set up a BBQ and a couple of chairs to create a beautiful outdoor area to host your guests. You can design a great area rug indoors or out, a table runner for a summer party or place mats for a spring holiday event. It’s a great decorating material that can be both chic and fun for the kids. Artificial Grass comes in a variety of colors from dark green to lime green or olive green. Blade height is variable from 1/2” to 2”. For an artificial grass vertical wall application, it would be best to opt for a short height so that it doesn’t look flat when it hangs. You can install artificial grass on most surfaces. However, it should be laid flat for the best appearance. Working in small sections offers the best results. Pull tightly for a smooth look and secure in place especially around the edges. You can buy or rent our EasySeam machine to seal the edges and to ensure there are no loose spots. Carpet tacks or staples can also be used for smaller areas. When installing on a balcony floor, make sure to use infill to keep the blades upright. Sand is one of the most common options, and it won’t break down time over time. Any blade height can work; it is all a matter of preference. You are only limited by your imagination when decorating an artificial grass vertical wall. The options can be endless and fashionable. In addition to making a fabulous artificial grass vertical wall, you could put it on a roof. Use it to create a unique permanent or removable surface indoors or outdoors. We can help you choose the right style for your next artistic project. Contact us today for some free samples at 844- 974-8873, or ask us for a free estimate.